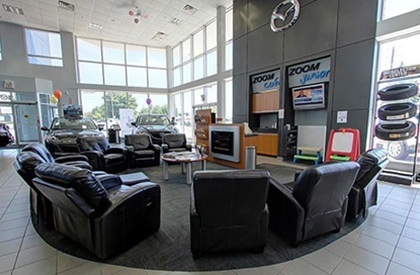 Experience the difference at our mazda dealership serving Scarborough East, Bowmanville, Ajax and Pickering. There's no better place to buy or service a Mazda in the Greater Toronto Area! We offer the best possible experience to our customers at our Mazda dealership, and that's why Mazda Canada has awarded us with the President's Club Award for excellence in sales and service 9 times in a row. 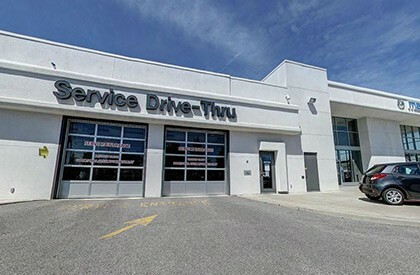 Ajax Ajax Mazda's state of the art facility is designed to provide Mazda owners with an excellent experience. Visit Ajax Mazda today! Ajax Mazda has consistently sold more Mazda's than any of our competitors in the area, year after year, by providing an excellent buying experience. Our awards for Dealer Of Distinction and Mazda President's Club show that we take pride in customer service and providing you with the best sales and customer service experience in the area. 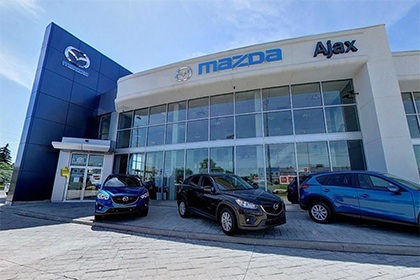 Our Mazda dealership also consistently outsells most Mazda dealers in Ontario, not just every Mazda dealership in the GTA, because at Ajax Mazda we work hard to make sure that you'll receive a better price and better customer service than any other Mazda dealer. Please have a look at our Mazda new car specials, factory incentives, and view our inventory of in-stock Mazda's. Come and experience the difference at Ajax Mazda! Ajax Mazda's used cars are hand picked by our managers to ensure that we only carry the finest used cars for sale. Our used cars, used trucks, used SUVs, used vans are safety and emissions tested, full reconditioned, Mazda Certified Pre-Owned, and completely detailed prior to delivery. The used Mazda vehicles on our lot are Mazda Certified Pre-Owned, offering you vehicles that have passed various tests to ensure they are in mechanically excellent condition. Ensuring that our vehicles are factory certified by Mazda allows our used Mazda vehicles to include extended warranty and special finance rates that are extended by Mazda Canada. We are the #1 Certified Pre-Owned Mazda dealer in Canada! Browse our inventory of incredible used cars to find the best pre-owned vehicle for you! We provide fast and friendly service for your Mazda at Ajax Mazda. Take advantage of our free shuttle service, comfortable waiting area with free coffee and refreshments, Wi-Fi, personal work space, same day appointments, and much more! All service is performed by Mazda factory trained technicians, and work by our mechanics is guaranteed so that you can be confident that your Mazda vehicle is running perfectly. Only factory trained technicians at a Mazda dealership can perform safety related warranty, and recall services for you free of charge. 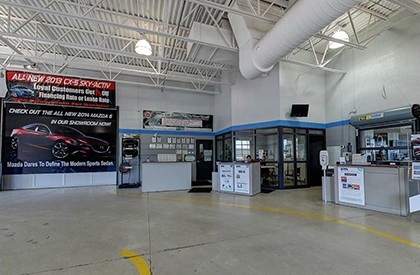 Getting your Mazda vehicle serviced at Ajax Mazda ensures that it has been extremely well maintained. Not only can we provide you with warranty service, and recall service, but at Ajax Mazda we will check your vehicle for recalls and warranty related repairs with a thorough inspection during each maintenance. Come and service your Mazda vehicle at Ajax Mazda!